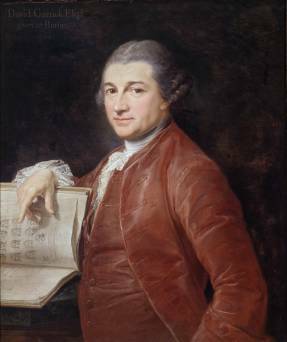 I haven’t had a chance to see this exhibit yet, but it’s got some great 18c portraits, and I don’t even have to fly to Oxford or Rome to see them. For a bonus, here’s the local review. Carl Fisher, who will soon be participating in the Long 18th MLA roundtable, is also helping to organize this comparative literature conference. The deadline has just been extended to Dec. 3, so hurry. I’ve taken the illustration from Michael Kwass’s “Big Hair: A History of Wig Consumption in 18c France,” from AHR, 2006, which anyone interested in hair-as-a-commodity should check out. 3. This is an older reference, but I thought others might find it pertinent. Rene at Age of Enlightenment (not too active lately) has a review of Gilly Lehmann’s The British Housewife. The most interesting observation is that the intended audiences for these cookbooks seems to have shifted over the course of the century from housewives to professional cooks, though mainly female cooks. How does this news story resemble this one? Explain. UPDATE and Bonus: try to find any mention of university administrators or “enrollments” in this article about excessive class sizes in higher education. And try to find some supporting evidence for the suggestion that new technologies will solve this problem. SECOND UPDATE. Aha. Here’s the homepage for one of the “sources” of this piece: Dr. Carol A. Twigg, who heads up the National Center for Academic Transformation, which seems to be a Pew-oriented non-profit arguing for a new surge of university investment into information technology and assessment. The good news: they say that distance ed and large lecture courses don’t work and are” labor intensive.” The bad news: they want universities to save money/teach more effectively by “redesigning” large volume intro courses to reflect their software/testing model, and relieve themselves of these “labor intensive” courses. Hmmm. Did the AP reporter just write up the press release? And has anyone on this blog had any contact with this group? For those of you interested in Michael Warner’s recent address on Politics and Religion, pursued from a slightly different angle . . . .
A more believable form of narrative is rather this: that the developments of “modernity” did indeed, destabilize earlier forms of religious life. No-one could even try to restore the sacral monarchy of France (Indeed, when Charles X tried to restore the full mediaeval coronation ceremony at Reims in 1825—complete with cures for scrofula from the King’s touch—it fell completely flat.) No-one can restore the village parish community whose time is organized around saints’ days and festivals, even though that was still very alive in parts of Europe (not to say Québec) in the first part of the last century. But this decay of older forms often is followed by a “recomposition” (Danièle Hervieu-Léger’s term) of new forms. Everybody has learned to identify a successive series of forms of congregational Christian life starting with Pietists and Methodists in the 18th Century, and then moving through and into (among others) the Pentacostal movements which in the last 100 years have grown in spectacular fashion (and also have burst well beyond the bounds of the “West”). David Martin has written on this. 3. So a crucial area of work is to recognize the nature and spread of the new forms. New kinds of devotion, discipline, congregational life; but also new ways in which (in some sense) “religious” markers become central to political mobilization, often in competition to more secular” markers (the two models of French nationalism, Catholic versus Jacobin; the struggle in the Arab world between Baathist or Nasserite nationalism and various forms of Islamism); and also the ways in which “religion” is seen as essential to the stability of social-moral order. This seems to me a much more plausible way to conceptualize the re-functioning of religion between the seventeenth and eighteenth centuries (explaining, for example, some of the differences between Methodism and old-fashioned Dissent), and explains better the importance of our period for an understanding of modernity and modernization. See also Simon During’s astute remarks on the secular and the mundane here, and Akeel Bilgrami on secularism and disenchantment here. Somewhere in the midst of these arguments is an important emerging position regarding the long-term historical significance of the European Enlightenment. Are scholars of the Enlightenment paying attention? UPDATE: here’s Stuart Jeffries’ mostly sympathetic review from the Guardian. And now, courtesy of 3quarksdaily, the oddly noncommital John Patrick Diggins review. Short Takes. . . .
1. In a recent interview, Derek Gordon, a VP at Technorati, observes that there are roughly 109.2 million blogs currently being maintained out in cyberspace right now, or roughly one blog for every 23 persons with internet access, or one blog for every 151 people alive on this planet, assuming the planet’s population to be around 6.6 billion. Of course, according to Gordon, many active bloggers maintain more than one blog, and the “vast majority of blogs exist in a state of total or near-total obscurity.” I don’t know what to think about this, but I do know that it’ll be an awfully long time before anyone responds to this post. 2. The Community College Dean and Dr. Crazy have a civil and productive exchange about unbridled, out of control, positively unhinged faculty hatred: senior faculty hatred of students, junior faculty hatred of senior faculty, universal hatred of administrators. What can I say? Administrators win hands down. 3. Profgrrrrl needs help organizing her notes, pdfs, etc. It’s an interesting question, now that most of us routinely spend our days moving from one medium to another, without any single medium or repository to hold our thoughts. It used to be xeroxes, or yellow pads, or manila folders, hanging files, and filing cabinets. What is it now? 4. Two of the reasons why I haven’t posted so much lately: this and this. I’m looking forward to Thanksgiving. Ooh, this is good. Thanks to Mercurius Politicus for letting us know about this one. 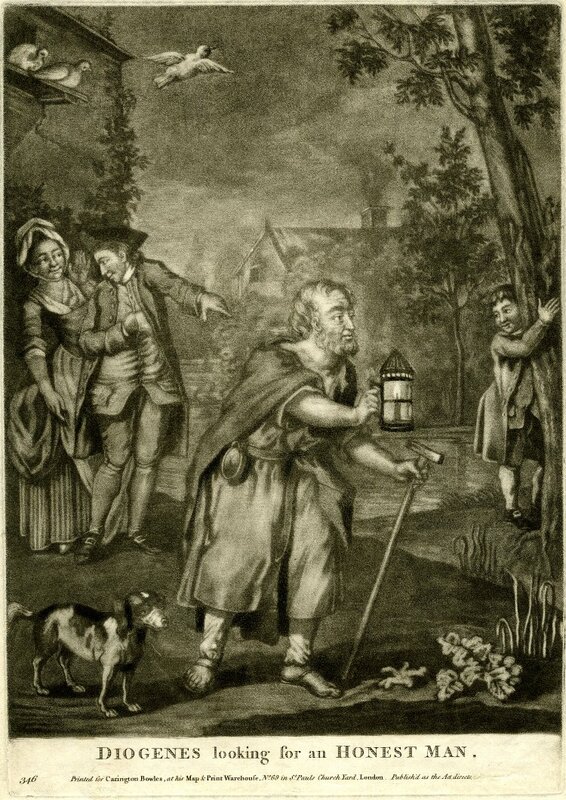 I could spend hours goofing around with the database, but as usual, I just typed in “Diogenes” to see what came up, and found this nice mezzotint of “Diogenes looking for an HONEST MAN” from 1776. Here’s the link to the BM: happy hunting.